Want more technical details about how Career Key displays and updates programs? Go to About the Assessment > Careers and Education Programs. After discoverers take the assessment and learn about their strongest personality types and work/program environments, they discover and choose from careers and/or programs of study that match them. Some options will be familiar and many will be new. Opening discoverers’ eyes to new, promising possibilities is one of Career Key Discovery’s (CKD) greatest strengths. Career and program exploration helps people make better career decisions. Research shows they are more engaged and satisfied with their career choices if they’ve fully explored the possibilities. CKD gives discoverers a context (Assessment Results) and framework (Careers and Programs) to guide their exploration. The goal of this step is for discoverers to select and save matching options that interest them most for further research and consideration. CKD encourages discoverers to explore and select from programs that match their top two or three personality types. Choosing from these options is more likely to lead to the their success and satisfaction. CKD organizes matching careers and programs in groups, with information describing each one. 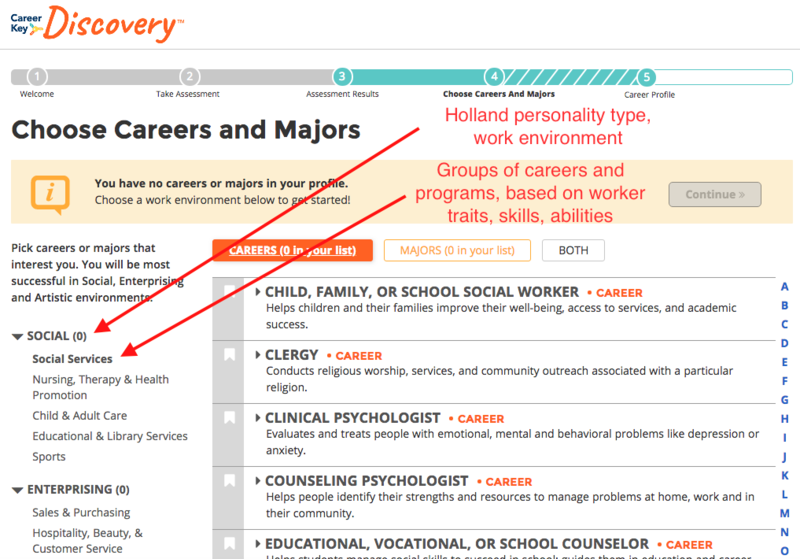 To improve user experience, Career Key uniquely organizes and displays matching careers and programs of study in groups. We classify them by Holland personality type, and then break them down into smaller groups within each type based on worker traits, interests, temperament, skills and abilities. Our approach is to open up more options for discoverers first, then empower them to narrow down and refine them. This leads to more valid, personalized and useful choices. CKD automatically opens up the discoverer’s top two personality types to display all their work groups. But at any time, the discoverer can open any of the six personality types to see their groups and options. For example within the Social personality type, the first three groups of programs are “Social Service, “Nursing, Therapy and Health Promotion,” and “Child and Adult Care.” Each one contains familiar options like social worker, nurse, and child care worker. But they also contain less familiar but promising options, like nursing anesthetist, exercise physiologist and licensed practical nurse. For careers, we include a short description of what the person does so even if they are completely unfamiliar with the career title, a discoverer might add it to their list of possibilities. Because they see careers and programs in groups, discoverers are more likely to explore the less familiar and consider them as possibilities. That’s important in today’s economy where people overlook many specialized, promising programs because they don’t know about them. Each career shows related education programs that are also compatible with that career’s dominant personality type. 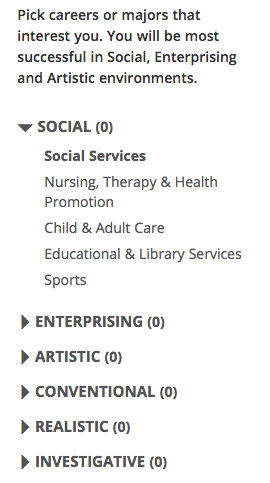 Each program shows related careers that are also compatible with that program’s dominant personality type. “Find Schools” links to the U.S. Department of Education’s College Navigator. As discoverers view their options, they can select/bookmark and save those that interest them most to research later. Selections are saved to the person’s Profile, which we’ll discuss more in the next steps of the Discovery Process. Discoverers can email the Profile to themselves, or download it in a PDF. We encourage discoverers to return to these lists of programs throughout decision-making. Over time, discoverers may need to remove some selections and look for new ones. CKD is a dynamic, continuing resource for discoverers. 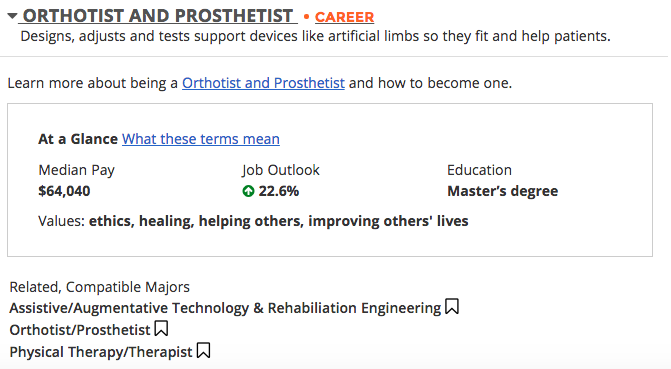 To ensure discoverers see the most relevant career and education information, CKD can vary the content it displays by the CKD plug in settings an organization chooses, including the country location. By Country: Careers and programs may differ by title, description, labor market information, related careers and education programs, and language. The United States is the default selection. If CKD does not display certain information, then it is not yet available for that country. By Organization: Colleges and universities may choose to display only the programs of study they offer. If they want to display careers as well, they can choose to limit the display of careers by the level of education required. For example, a four-year college may only want to display careers that require a bachelor’s degree or more.